Cigarettes have long been known to be one of the leading causes of fire deaths in the United States. Each year between 700 and 900 lives are lost to fires whose ignition source was cigarettes. In 1984 and 1990 the United States Congress tasked the National Institute of Standards and Technologies (NIST) to explore whether cigarettes with a reduced ignition propensity were technically and commercially viable. Technical advisory groups were formed consisting of representatives from the Consumer Product Safety Commission, the U.S. Fire Administration, the Federal Trade Commission, the National Cancer Institute, representatives of the tobacco and furniture industries, fire safety professionals and public health and safety advocates. The first study determined that cigarettes with a reduced ignition propensity were viable. The second study developed testing methods that would accurately portray what happens when a cigarette was dropped on furnishings. 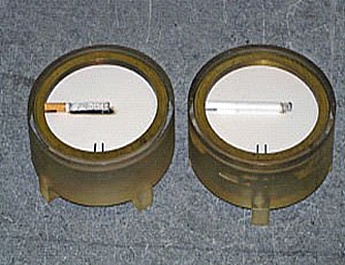 NIST was again involved in testing in 2000 when they tested a cigarette that was designed with a reduced risk of igniting a fire if it was dropped or discarded. The testing found that the cigarette did exhibit a reduced ignition propensity. In 2004 New York became the first state to mandate that manufacturers provide only fire standard compliant cigarettes be sold in that state. Fire standard compliant cigarettes (FSCC) are designed to reduce the amount of time that a cigarette continues to burn when it is not actively being smoked. By reducing the amount of time the cigarette continues to burn it is less likely to ignite furniture or bedding material. 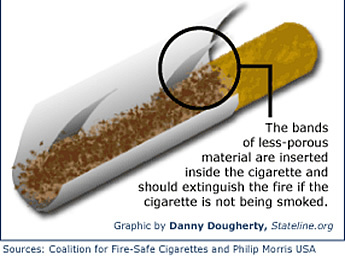 The predominant method that cigarette companies use to produce fire standard compliant cigarettes is by wrapping the cigarettes with two or three thin bands of paper that is less porous than the outer paper tube. These bands act as “speed bumps” slowing down the burning of a cigarette, causing it to self-extinguish. The Mississippi Fire Safety Standard and Firefighter Protection Act law goes into effect on July 1, 2010. Retailers will be allowed to sell their existing inventory if the state tax stamp was affixed to the cigarettes before July 1, 2010 and they can establish the inventory was purchased prior to July 1, 2010 in comparable amount to inventory purchased the previous year. After July 1, 2010, all cigarettes sold in Mississippi must be certified fire standard compliant in accordance with SB2249. Retailers must allow representatives of the State Fire Marshal’s Office or any law enforcement personnel to inspect the records and stocks of cigarettes sold in their establishment. The Mississippi Fire Safety Standard and Firefighter Protection Act requires a special marking on cigarette packaging to indicate compliance with the cigarette fire safety standards. The marking will consist of the letters “FSC”, which signifies fire standard compliant, and will be placed at or near the UPC code. Manufacturers are required to supply distributors and wholesalers with a sample of their marking. Retailers will receive illustrations of approved fire standard compliant cigarette package markings from their distributor or wholesaler. According to the Harvard School of Public Health Report, cigarette sales have not shown a decline after the implementation of the fire-standard compliant cigarette. Wholesalers/distributors will be allowed to sell their existing inventory if they can prove the state tax stamp was affixed to the cigarettes before July 1, 2010, in a quantity that is comparable to the quantity of cigarettes they purchased during 2009. After July 1, 2010, all cigarettes sold in Mississippi must be certified fire standard compliant in accordance with SB2249. Wholesalers and distributors have to provide, to each of the retailers to which the wholesale dealer or distributor sells cigarettes, a copy of the fire standard compliant package marking that they received from the manufacturer. Wholesalers and distributors must allow the Attorney General, the State Fire Marshal, State Tax Commissioner and other law enforcement personnel and their duly authorized representatives to inspect the records and stocks of cigarettes within their establishment. Any product meeting the definition of a cigarette in SB2249 must be certified by the manufacturer to be fire standard compliant. Each variety of cigarettes must be tested at a laboratory meeting ISO/IEP 17025 accreditation. After the cigarettes have been tested the manufacturer may certify the cigarette as fire standard compliant for sale in Mississippi. The certification fee of $1000.00 per brand family of cigarette must accompany the certification form. Certifications are valid for three years from the date the certification was received by the State Fire Marshal’s Office. Manufacturers must re-certify each variety of cigarettes every three years. Manufacturers must retain copies of the reports of all tests conducted on all cigarettes offered for sale for the previous three years and provide copies of the documentation upon written request from the State Fire Marshal’s Office. The State Fire Marshal’s Office appreciates the cigarette manufacturers' continued support and cooperation. The cost of cigarettes is not anticipated to increase due to fire standard compliant cigarette technology. The Harvard School of Public Health study, conducted after New York began requiring fire standard compliant cigarettes; comparing prices in upstate New York State to prices in Massachusetts found that prices remained comparable. There may be a reduced availability of a small number of older brands and sub-brands due to the fire standard compliant cigarette regulations. The establishment of the Mississippi Fire Safety Standard and Firefighter Protection Act in Mississippi is not an anti-smoking campaign. The State Fire Marshal’s Office is primarily concerned with fire safety and preventing deaths, injury and property loss due to cigarette ignited fires. All requirements concerning the establishment, implementation and enforcement of the Mississippi Fire Safety Standard and Firefighter Protection Act are found in the text of SB2249, as signed into law by Governor Haley Barbour: Full Text of the Mississippi Fire Safety Standard and Firefighter Protection Act. All cigarettes sold within the State of Mississippi must be certified by their manufacturers using the Mississippi Fire Standard Compliant Cigarette (FSCC) Certification Website. Payment of the certification fee is part of the certification process. The FSCC Certification Website is now live and manufacturers should click here to begin the certification process.